I am a staunch tea-drinker, in contrast to the coffee culture of many offices. So I have my own little collection of tea things at the office. It’s become a sort of break from the workday when I make my cups of tea throughout the day. The workhorse is my electric kettle. I had shared one with a coworker for a while, but I recently got my own. Since it sits out on my desk, I decided to spring for an attractive ceramic kettle. I think the floral pattern cheers up my cube, although with my flowery kettle and hand-crocheted shawl, I must be someone’s granny! The kettle holds just enough water for two mugs of tea, so I generally fill it once in the morning and once in the afternoon. From there, I move to my tea mug. 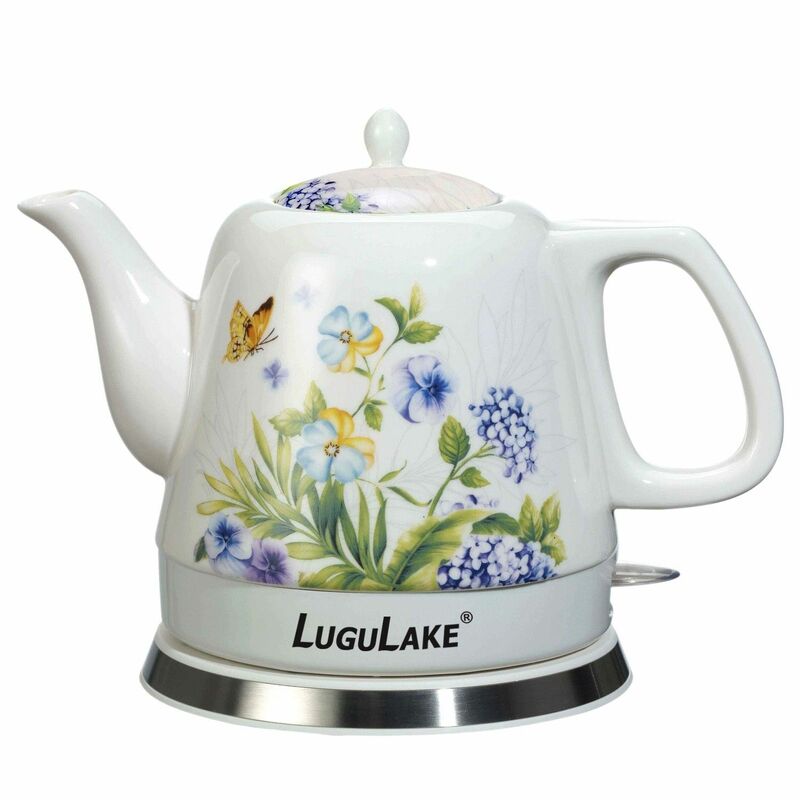 It has an infuser and a lid, which is great because I can brew whole-leave tea very easily, allowing plenty of room for it to unfurl, and then use the lid as a rest for the infuser, or put the lid on to keep the tea hot during long meetings. It cleans easily if I dump out the old leaves and leave it to dry upside down. My tea collection at work ebbs and flows, but I try to have at least one green tea, one oolong, and one black tea. I like Rishi Tea a lot. Their company is friendly and their teas are top-notch. I generally ask for some of their more exotic stuff for holiday gifts. Right now, I have a tin of Jade Cloud green tea, a tin of their Wuyi oolong tea, and a tin of Republic of Tea’s Assam Breakfast tea. I also have the end of a tin of an expensive milk oolong tea from a local tea shop. Rishi Tea’s Wuyi oolong is one of my favorite teas. It has a subtle floral-honey taste to it and brews a beautifully delicate amber color. The milk oolong I have is slightly less oxidized and I brew it for longer. It has a strong creamy aroma, which is characteristic of that style of oolong. Jade Cloud is my go-to green tea because it’s inexpensive. It has vegetal and seaweed notes. And as the weather cools, I’ve been favoring black teas more, so the Assam Breakfast has been my morning tea of choice, brewing up very dark and stimulating with a faint syrupy-raisiny flavor and aroma. I generally steep my tea leaves three times throughout the day, adding about 30 seconds each time I steep. This is both economical and I think reduces the amount of total caffeine I drink, but I get a lovely aroma and experience each time. I consider it a waste to only experience a serving of leaves once. My tea time is my mini-break. I tend to brew a cup of tea when I get to my desk, while I collect my thoughts and focus my day, and then again with lunch, and again in the afternoon with a little snack to recharge before the final couple of hours of the work day.